Every day taxonomists are busy in labs, museums and the field, to collecting, cataloguing, identifying, comparing, describing and naming species new to science. Some 300 taxonomists globally contribute their valuable time to keeping the World Register of Marine Species (WoRMS – www.marinespecies.org) up to date. Today 19 March, on World Taxonomist Appreciation day, we wants to celebrate our taxonomic editors for this important task with the publication of a top-ten list of marine species described in 2018. Nominated and voted for by our taxonomists! This annual top-ten list by WoRMS are just a small highlight of the almost 2,000 fascinating new marine species discovered every year. All 300 editors of WoRMS were given the opportunity to nominate their favorite marine species newly described in the last year 2018. 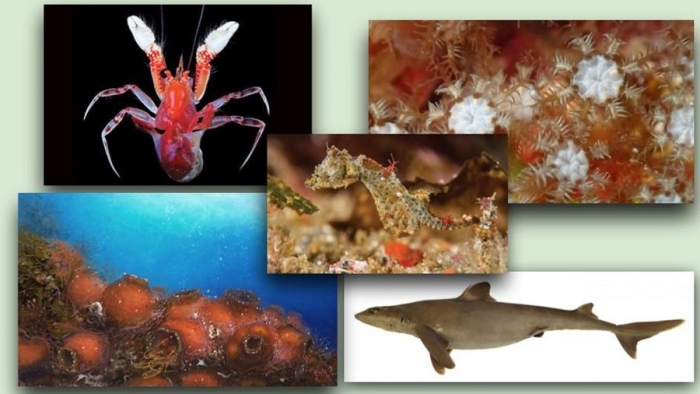 The final decision reflect the immense diversity of animal groups in the marine environment (including fish, crustaceans, molluscs, corals, sponges, jellies, worms) and highlight some of the challenges facing the marine environment today (e.g. invasive species, ecosystems threatened byclimate change, deep-sea environments impacted by resource extraction). The final candidates also feature particularly astonishing marine creatures, notable for their interest to both science and the public. Each of these marine animals has a story. From the bizarre blanket hermit crab which uses an anemone ‘blanket’ instead of a shell for a home, the Hong Kong Sea Dragon, a species which is only the second to be described in its phylum, to a ‘walking’ deep-sea leech! Read all about it on the website of WoRMS and LifeWatch-Belgium.